This Family Pass provides kids and adults a fun and easy way to experience San Francisco’s main landmarks in addition to admissions to family's favorite activities to do in San Francisco - Madame Tussauds + 7-D Experience! This pass provides unlimited hop-on and hop-off use for 24 hours on Official City Tour and on Sausalito Tour. Everyone loves the ride on an open top Double Decker bus, which you can enjoy with the 1-Day Hop-On Hop-Off Tour! 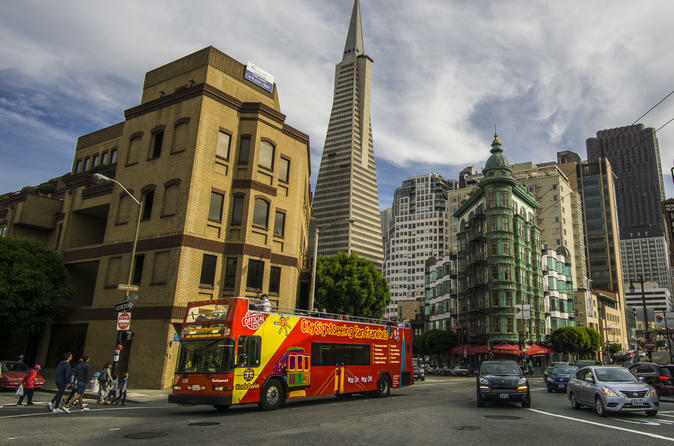 Choose to either stay on the bus for the 2.5 hour City Tour or hop on and off at any of the stops with many family friendly activities along the way, such as Pier 39 with its famous sea lions, the Exploratorium, Chinatown, Walt Disney Family Museum, Aquarium of the Bay and the California Academy of Sciences in Golden Gate Park. Once you hop off the bus, you can visit Madame Tussauds Wax Attraction where you can get closer to fame than ever before. Cozy up to George Clooney on the sofa, jam on stage with Jimi Hendrix or Beyoncé, and go behind the camera with Steven Spielberg. Hang out with Mark Zuckerberg, take a ride with E.T. or meet some of the greatest U.S. sport icons of all times. And to make this day even more fun, experience the thrill of a rollercoaster and the excitement of a state-of-the-art laser blasting game all at once at the 7-D Experience. The 20 seat theater, massive movie screen and the newest 3D technology will keep your senses reeling as you RIDE, BLAST and COMPETE your way into other dimensions! © 2019 Hello SanFrancisco - All Rights Reserved.